I think this is one of the best news so far! The Manila Electric Company (Meralco) said that overall rates went down by PhP 0.70 per kilowatthour (kWh) this May. Said decrease is due to lower generation costs from all power suppliers of Meralco. 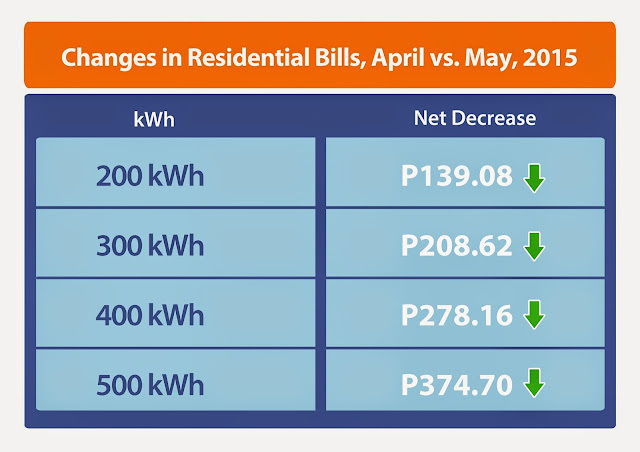 For a typical household consuming 200 kWh, the overall electricity bill will go down by PhP 140. 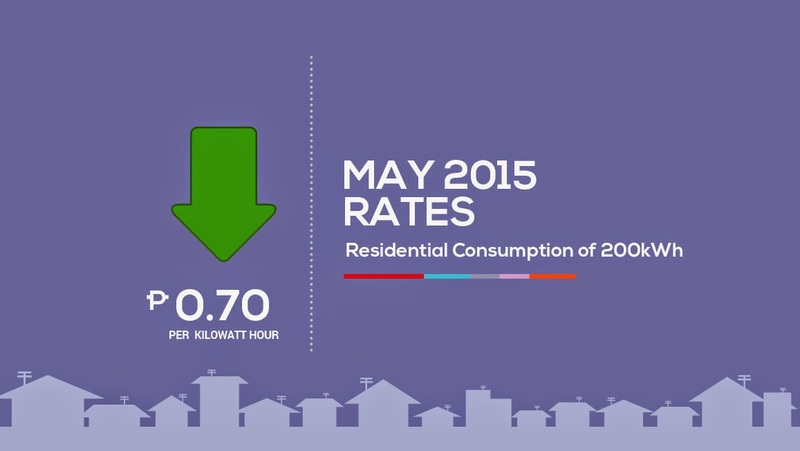 At PhP 9.98 per kWh, this month’s rate is lower by PhP 1.46 compared to May 2014’s PhP 11.44 per kWh. 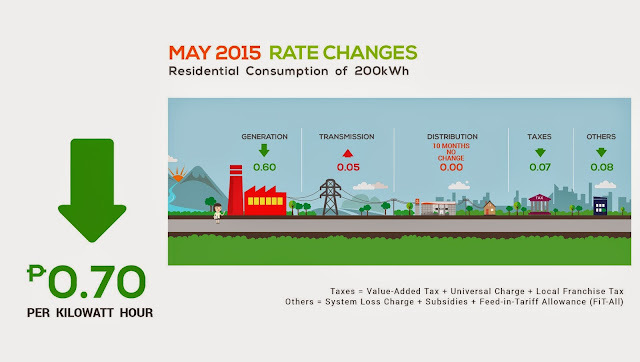 Generation charge decreased by PhP 0.60 per kWh from PhP 5.41 per kWh in April to PhP 4.81 per kWh this month. The reduction was mainly driven by lower charges from the Wholesale Electricity Spot Market (WESM) and Independent Power Producers (IPPs), as well as a reduction in the National Power Corporation’s (NPC’s) Generation Rate Adjustment Mechanism (GRAM) collections. Cost of power obtained from the WESM decreased by PhP 4.19 per kWh due to less occurrences and shorter duration of power plant outages. The Luzon Grid remained on “normal” state throughout the period of the Malampaya shutdown. Meanwhile, average cost of the Independent Power Producers (IPP) was lower by PhP 0.75 per kWh due to the improved utilization level of the QPPL power plant and cheaper fuel prices obtained by the First Gas plants. The effect of the Malampaya shutdown was moderated by lower prices of condensate and natural gas in the April supply month versus March. Malampaya natural gas underwent its quarterly repricing to reflect the lower cost of fuel. From $10.39 per gigajoule (GJ) the previous period, price of natural gas has been reduced by 19% to $8.44 per GJ. Average rates of plants under the Power Supply Agreements (PSAs) also decreased this month by PhP 0.06 per kWh. Finally, NPC’s collections of its GRAM similarly went down by PhP 0.06 per kWh. The share of IPPs, PSAs, and WESM to Meralco’s total power requirements stood at 47, 43, and 10 percent respectively. In addition to the generation charge, taxes and other charges registered reductions of PhP 0.07 and PhP 0.08 per kWh, respectively. These offset a PhP 0.05 per kWh increase in the transmission charge. Meralco reiterated that it does not earn from the pass-through charges, such as the generation and transmission charges. Payment for the generation charge goes to the power suppliers, while payment for the transmission charge goes to the National Grid Corporation of the Philippines (NGCP). Of the total bill, only the distribution, supply, and metering charges accrue to Meralco. Meralco’s distribution charge has not registered any adjustment and has remained at the same level for 10 months now or since July 2014. Meralco also reminded its customers to observe electrical safety in line with its initiatives to support Electrical Safety Month. The government has declared the month of May of every year as Electrical Safety Month. Meralco said it fully supports initiatives that raise public awareness and educate electricity consumers on the proper use of electrical appliances and gadgets so as to prevent and avoid electricity-related accidents. For more electrical safety tips, customers may visit www.meralco.com.ph. They may also access Meralco’s Facebook page (www.facebook.com/meralco) and Twitter account (@meralco).